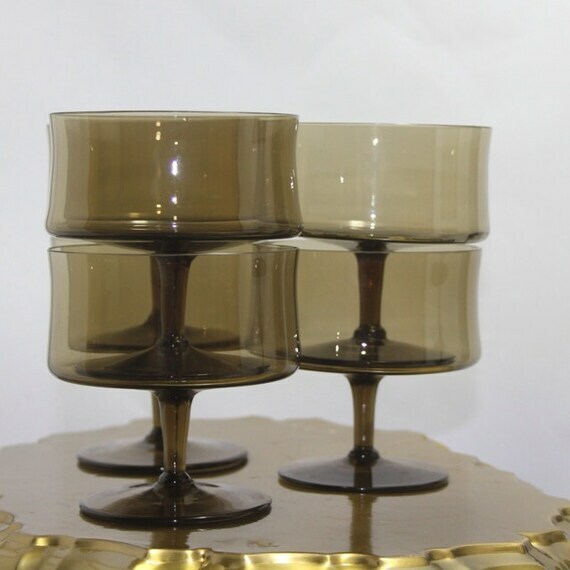 Vintage European Set of (6) vintage smokey Tawny brown dessert glasses with stem. Elegant Shape and high quality glass, this is a beautiful set. This vintage stemware is perfect for pudding, custard, jello, and fun for cocktails. Great addition to your next dinner party. Matching glasses available in water gobbles, wine glasses, tumblers, and high ball. This entry was posted in http://feedproxy.google.com/~r/JujubefunnyFinds/~3/kooD0p5Suz4/elegant-european-sherbet-custard-glasses1385454105 and tagged IFTTT. Bookmark the permalink.